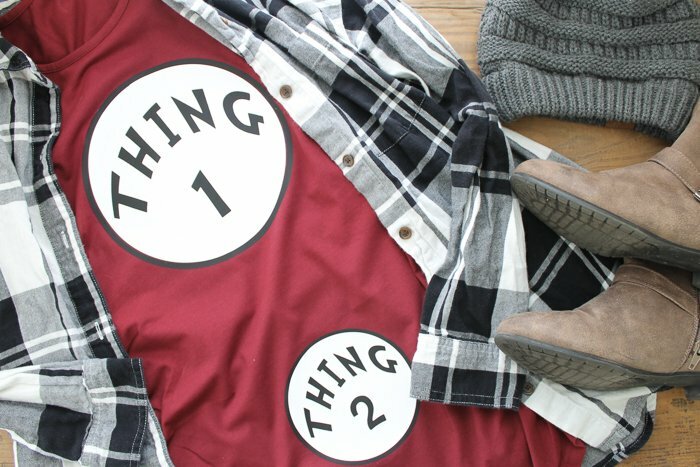 A Halloween maternity shirt has to be the cutest way ever to show off your baby bump. If you have not seen, my daughter is pregnant with my second grandchild and I wanted to do a little something for her. I am offering up this free SVG file for y’all to cut using your own cutting machine (like a Cricut or Silhouette). I am also joining up with some other bloggers to bring you a ton of other free SVG files that you can use in your crafting this season. So, read on for the details! Start by downloading the SVG file and uploading it to Cricut Design Space (or your machine’s program). I have instructions for how to do this on a Cricut machine here if you need them. Then cut the shapes from black and white iron-on. It should pull in with everything attached together but if not, be sure to attach the black circle with all of the letters so it cuts as one piece. Then resize if needed and cut with the image mirrored. Be sure to cut with the shiny side of your iron-on face down on the mat. Then weed all excess from around your design on both the white and the black. First, iron your white circle in place. Be sure to center it on the shirt and follow all directions (including time and temperature) that come with your iron-on product. Remove the carrier sheet once in place and lay down the black right on top as shown below. Again, iron according to the time and temperature indicated and peel up your backing sheet. 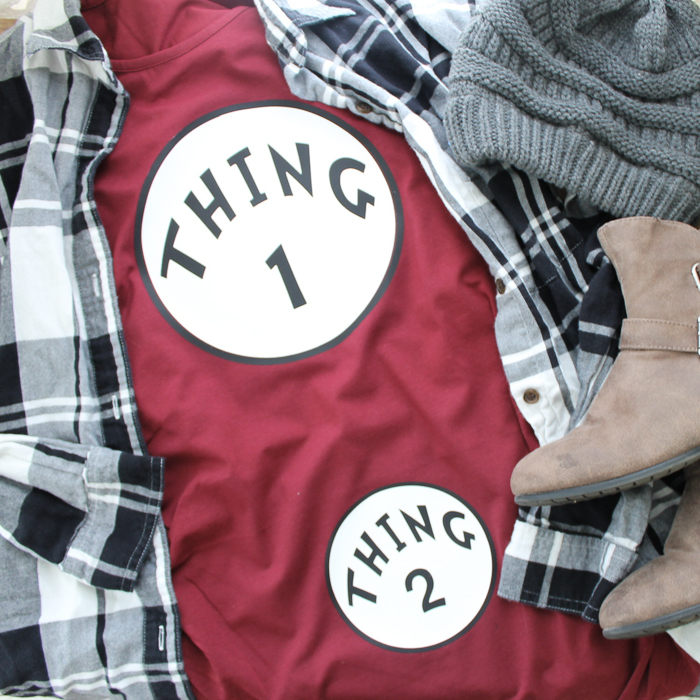 Repeat the entire process for the “thing 2”. 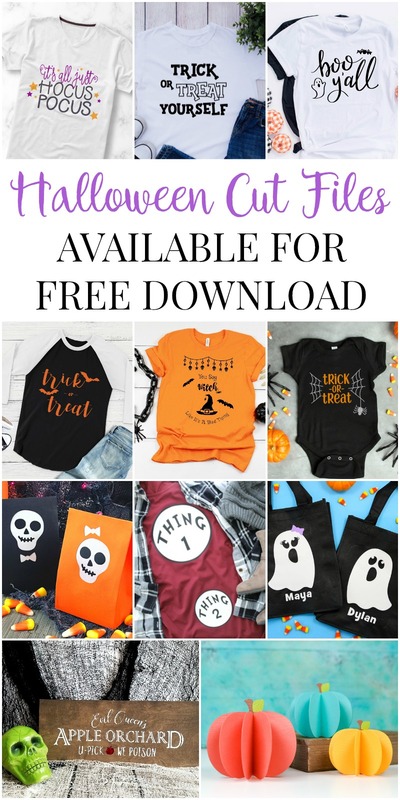 You are left with one cute Halloween maternity shirt once you are done! 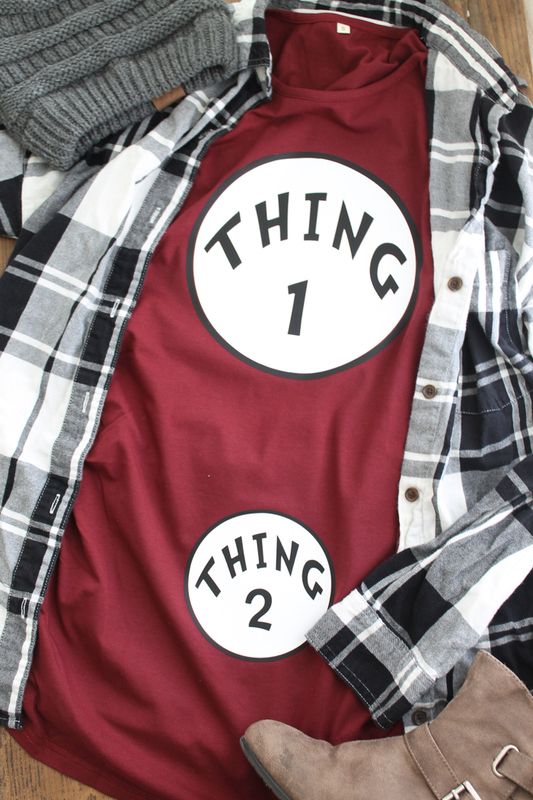 Making your own Halloween maternity shirt is so quick and easy. 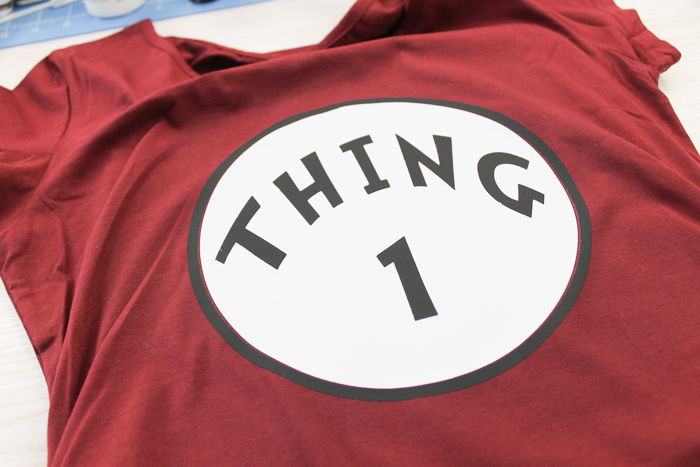 You can make this Dr. Seuss inspired version or come up with a design that is all your own. Pick up some iron-on today as it is really the easiest way to make craft projects like this one and so much more. 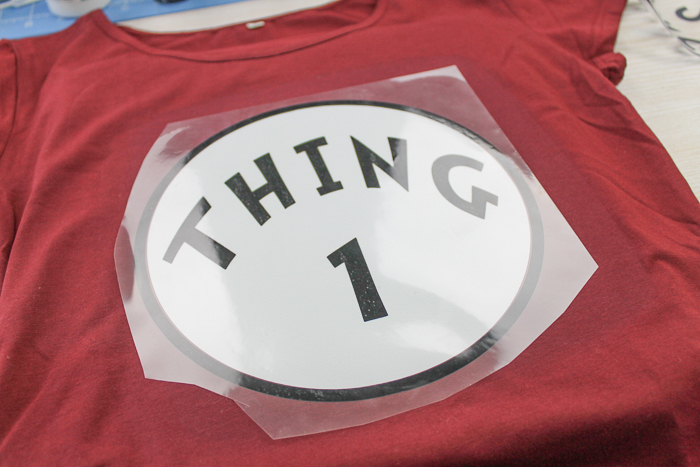 You can click here to read more about all of the materials that you can add iron-on to. 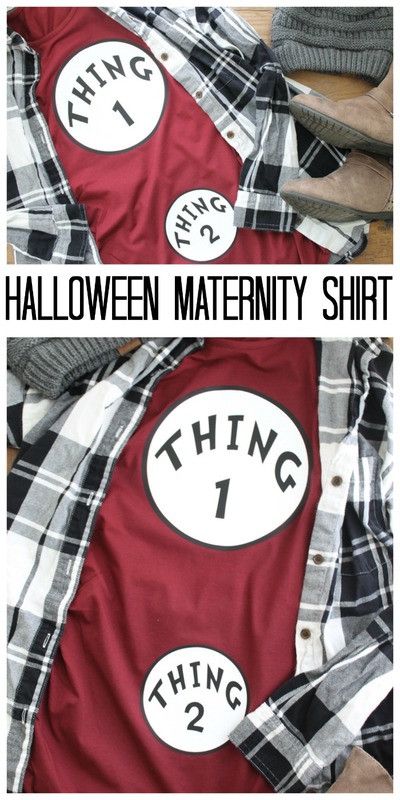 Now, if you know someone that is pregnant or are pregnant yourself, be sure to make this adorable Halloween maternity shirt! I promised you even more free SVG files for Halloween! Check out the links below for tons of ideas to make with your Cricut or any other cutting machine. This is adorable and congrats to you on your 2nd grandbaby. Oh this is too cute! What a fun idea! Thanks for sharing at Merry Monday; I’m going to include your costume idea in my Party Features next week 🙂 And congratulations on your newest grandchild!